My wife and I recently moved into a new house. Moving is always a bittersweet situation. On one hand, moving brings new opportunities, new challenges and (hopefully) larger garages and shops. On the other, it brings questions of security and disruption of routine. For someone like me who’s a bit of a creature of habit, it can be unsettling trying to sleep in a new location. New noises, creaks and movements in the night paired with unfamiliar neighborhoods means I’ve woken up more than once and cleared the house with my nightstand gun and flashlight. Now that I’ve been in the house for a few months I’ve gotten better, however, security improvements have been a hot priority for me. I’ve had several friends that have experienced home invasions, not always with a happy ending. 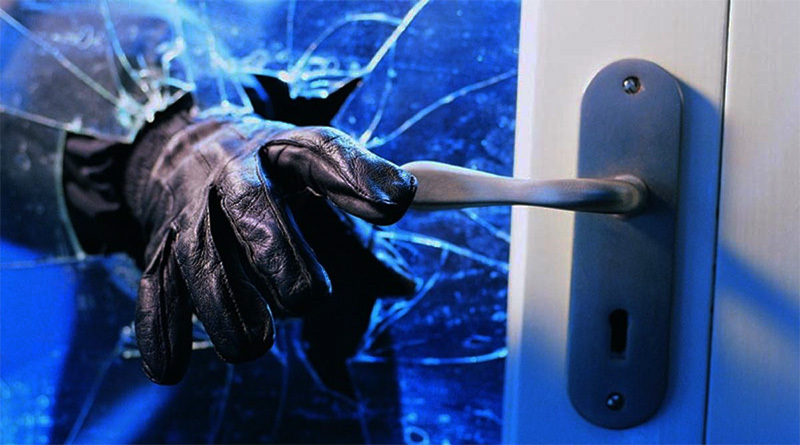 In fact, the Bureau of Justice reports that in 38% of home invasions, the dwelling is occupied. Additionally, 7% of those burglaries ended in violence. Due in part to this, as well as my own experiences, I’ve started to analyze my nightstand weapon setup. I’ve been testing out several avenues and configurations, doing research on various products and setups. 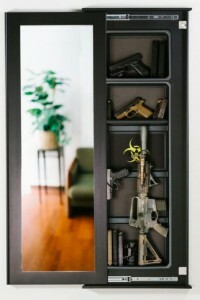 Below I’ll be sharing the best gun safe solutions I’ve found that should have something for everyone. Tactical Walls have been around for several years, and they’re still at the top of their game. While more expensive than many other offerings below, they offer attractive options and the capability to have concealed firearms located in virtually any room. Top end models feature simple security without compromising speed of access, as well as more storage room such as the ability to store shotguns and rifles along with pistols, lights, and other items. 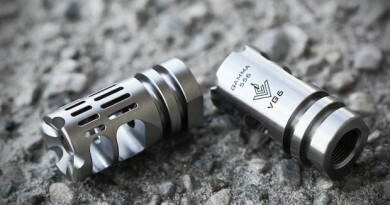 The 1450M Bundle is a full-length mirror insert with locking system and magnetic key, capable of storing several pistols, lights, magazines, and rifle. If you own your own home, this is an attractive option, allowing you to keep everything you may need to be concealed while allowing rapid access in the event of an unexpected guest. The 1450M features shatter-resistant glass with a plywood backer and full hardwood encasement for additional security. The magnetic locks shouldn’t be considered as high-level security, but they’re robust enough to keep kids out and resist simple manipulation to open. They’re also very fast to utilize, allowing you to simply place the magnetic lock on the outside of the mirror or shelf and release the mechanism to gain access in seconds. It’s worth noting, however, that the same lock that allows rapid access, can be easily lost or misplaced when you need it most. Tactical Walls are handmade in the USA. 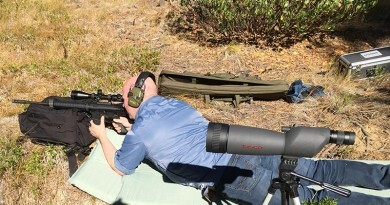 Overall one of the best options when concealment and ease of access are primary concerns. For a video walkthrough of exactly how they work, check out Iraqveteran8888’s YouTube video. The Gunvault SpeedVault line of products are well reviewed. While not the most attractive or discreet offering, these units were designed to secure a firearm while keeping it highly accessible. Mounting to a wall, desk or nightstand helps prevent a smash and grab while also securing the firearm from kids and guests. Made of 18 gauge steel, both models are powered by a single 9-volt battery and come with interior lights the stay on for about 20 seconds after opening. A very helpful feature for nighttime access. They can also be configured for silent entry. While the reviews of the biometric version are mostly positive, I always tend to stay away from that access method. Unless it’s made by Apple, I’ve never had good luck with biometrics. Wet or dirty hands, shaking, poor alignment and other issues can decrease the ability to access your firearm when you need it most. Checking on Amazon for reviews yields just enough negative comments on that version to recommend going the keypad route. Overall, if security combined with easy access is your main concern, the $144 Keypad SpeedVault 500 is a great offering. The Sentry Safe Biometric Quick Access safe is probably the only model out there that I would recommend if biometrics are a big selling point to you. The price point is better than most its competitors while offering more features, higher security, reliability and accessibility options. I’ve not heard of any solid complaints around the biometrics on this device, however, should you need access to your firearm and the biometrics fail, you can use punch codes to open as well. There’s no real downside to adding biometrics in this configuration. Featuring 12 gauge steel and a pry-resistant door, it’ll resist most any non-expert attempt at entering. The SpeedVault 500 offers more mounting options, however, the Sentry Safe offering does have two screw holes for mounting within a drawer, which is why we’ve given it the concealment tag as well. Since it is a smaller safe, I’d definitely recommend mounting it to a sturdy piece of furniture, or at least mounted and concealed within a drawer. It weighs about 13 lbs and is powered by 4-AA batteries. If biometrics is your thing, this is probably the best nightstand option around. Many people are probably thinking “What about The Gun Box?”. I can’t recommend The Gun Box simply because there is too much noise around the unreliable operation of both its main access methods, that being RFID and biometrics. Additionally, with the much higher price points (over $300) and low-strength materials (Aluminum alloy vs 12 gauge steel), it just doesn’t belong in the conversation. 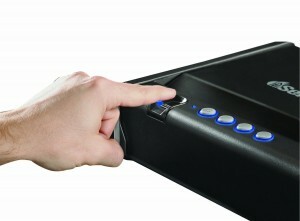 If you were looking at The Gun Box, save your money and get the Sentry Safe Biometric. These next few products have hundreds of varieties, therefore I’m bundling them into one section. Mattress Handgun Holsters, long gun brackets and gun magnets are the class of items that are great at one thing: Getting to your gun quickly. Specializing only in ease of access, these products shouldn’t be used if you worry about guests or children. 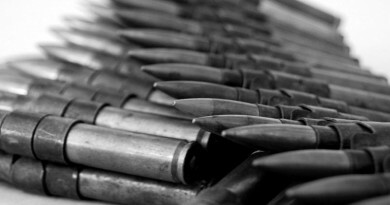 They also shouldn’t be used for storage of a firearm, as they provide no security and are always in plain sight. They should be used if you’re in a high-risk area or your gun moves from your hip to your bed and back again; always within reach. 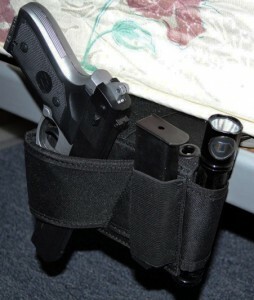 I typically use paddle-style holsters that are frequently either secured to my hip or removed and sitting next to me, so adding a 3rd option of holstered to my bed is attractive. 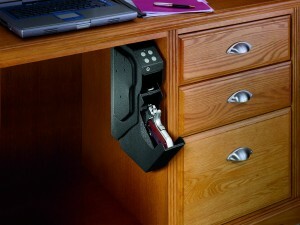 If you have a home office or room you find yourself in frequently, you can also utilize a desk mounted gun magnet. Several varieties of this exist as well, and again offers no security and very little concealment. All three of the options noted above can be had for less than $30, so it might behoove you to check out various styles in each and only keep the ones that work for you.